DrinkWire is Liquor.com’s showcase for the best articles, recipes and reviews from the web’s top writers and bloggers. In this post, Creative Culinary offers a summer bourbon cocktail. If you’ve been reading my latest posts then it should come as no surprise that I’m still all about summer cocktails, even at this late date…oh my gosh, even in September! When challenged by Liquor.com to make a bourbon cocktail with a twist, I knew that standard practice might be to move more towards the flavors of fall including apples, cinnamon, cider, and more. But I just could not so I’m still here bringing summer in a glass to this last holiday of the summer season. I made this cocktail for a crowd and to make it simpler I used lemonade concentrate although I did add my secret ingredient for the best lemonade…some lime juice! I have found I love the combination of lemon and lime juices in cocktails that are best known for their lemon flavor; including my favorite Margarita and the best doggone Lemon Drop Martini I’ve ever had. So…how could it be bad? Quick answer? It wasn’t! As is typical I had neighbors to share this with. Although a couple are more typically beer drinkers and some (like you!) were thinking, ‘Bourbon with raspberries and lemonade Barb?’ but all took a leap of faith and downed these like champs. That truly is the only worry…it’s hot and it’s lemonade-ish and you have got to remind yourself…this has booze in it! While I would most typically make my own lemon simple syrup for one or two cocktails, I decided to take advantage of a freezer full of lemonade concentrate for this crowd concoction. I have so much stuff in my freezer that I am desperate to use some things to make room. I had just roasted 6 lbs of Hatch green chiles so in with the new and out with the old; or in this case, the too much of and it made it especially simple to whip up a batch for a crowd. The lime juice equates to about 3 fresh limes and really does add a nice subtle touch. Thirsty yet? Still plenty of time to make this for your holiday get together or in my book sometime in the next couple of weeks; you know, while it’s still SUMMER (until September 22 in 2017 actually!). Cheers! Combine the water, sugar and raspberries in a small saucepan and bring to a boil. Stir until all sugar is combined and turn to low and simmer for 10 minutes. Strain mixture over bowl to remove seeds. Cool. Combine the raspberry simple syrup, lemonade concentrate, lime juice, cold water, and bourbon in a pitcher filled with 3 cups of ice and mix well. In an ice filled highball glass, fill the glass with the Raspberry Bourbon Lemonade; leaving one inch headspace. 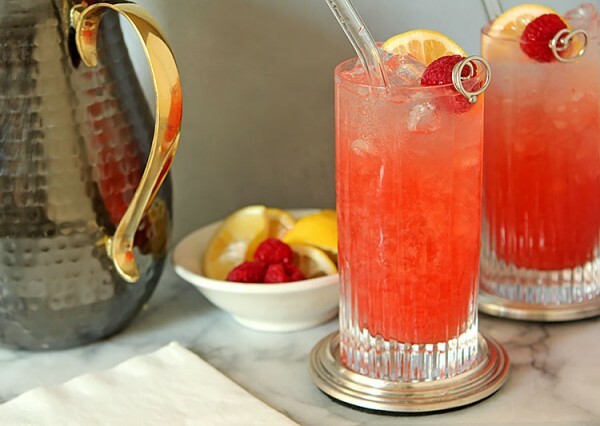 Top with sparkling soda, stir gently and garnish with a lemon wedge and raspberry.